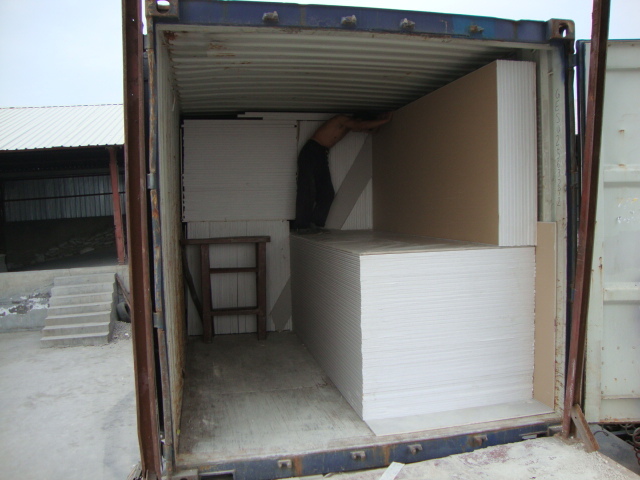 Baier gypsum board using high purity gypsum powder as main material and mixed with fiber and highquality additive ,have three types : Regular , Fire-Resistant , Water –Resistant gypsum board ,can be used as partition and ceiling material and have advantages: fire-proof, sound insulation, heat preservation, quakeproof and good for health. we have passed ISO9001:2000 and ASTM(USA)certificate ,all these guarantee our top grade products. Our main business is covered more than 30 provinces inChina, more than 100 countries and areas allover the world. bedroom, Home,Shop,Supermarket schools, hospitals and other ceiling and drywall. Features: green environmental protection, convenient construction, space saving, comfortable living. By Bulk :Every two pieces face to face are packed with sealing paper.